Modern regulatory takings disputes present a key battleground for competing conceptions of property. 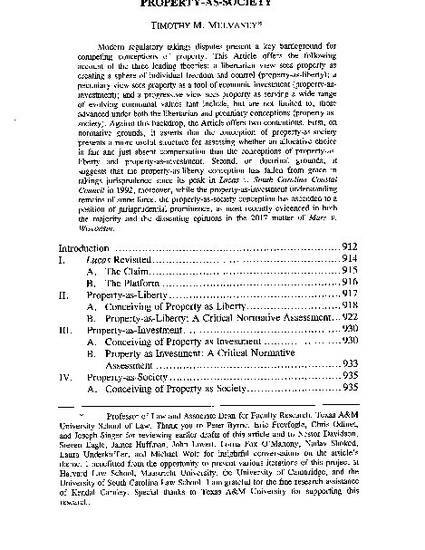 This Article offers the following account of the three leading theories: a libertarian view sees property as creating a sphere of individual freedom and control (property-as-liberty); a pecuniary view sees property as a tool of economic investment (property-as-investment); and a progressive view sees property as serving a wide range of evolving communal values that include, but are not limited to, those advanced under both the libertarian and pecuniary conceptions (property-as-society). Against this backdrop, the Article offers two contentions. First, on normative grounds, it asserts that the conception of property-as-society presents a more useful structure for assessing whether an allocative choice is fair and just absent compensation than the conceptions of property-as-liberty and property-as-investment. Second, on doctrinal grounds, it suggests that the property-as-liberty conception has fallen from grace in takings jurisprudence since its peak in Lucas v. South Carolina Coastal Council in 1992; moreover, while the property-as-investment understanding remains of some force, the property-as-society conception has ascended to a position of jurisprudential prominence, as most recently evidenced in both the majority and the dissenting opinions in the 2017 matter of Murr v. Wisconsin.